Request a call back to receive a brief introduction, lasts 3-4 minutes, on our training courses, and afterwards, I can answer questions or discuss anything further. Register Now to learn dental handpiece sales & repair from the world's largest supplier of dental handpiece repair training. We will show you how to open a simple & profitable business from home in a stable, growing industry for much less than our competitors! Be in the dental industry with stable growth that you control. Calling one & all! No previous experience needed. You can with a very small investment, a week of your time & a little bit of travel learn the skills needed to open a small business. We have trained over 250 people from around the world to open their own business. Follow our check sheet of things to do before opening & begin to market your business quickly after training. Join us to learn the skills needed to open a dental sales & repair center which is a profitable, stable and simple business concept. Or, use this training to add to your income with a business that can easily be run part time from home. This business has low start up costs, has high demand, is recession proof and has immediate cash flow. Reserve your spot now, before all spaces are full. "Looking for Handpiece Training? You can't go wrong with Orion. When I was researching business opportunities, I considered purchasing a franchise, attending training with an established company and using their name, or taking a private class. I decided a private class was right for me and Orion Dental Training had the best bargain. After completing my course with Paul and Amanda, I know I made the right decision. The skills acquired during each session are remarkable. The materials and support you receive make a great combination for successes. If I had to make my decision over, I would not change a thing." "...By the way, the training course was very informative, interesting, & educational. Your teaching/instructional style was very effective in terms of allowing us the time & support in retaining the necessary concepts, and skills in dental hand piece repair. I was very impressed with Paul's patience in supporting our group during hands on training and his thorough delivery of the theoretical component of the training was excellent. In addition, Amanda's marketing session was extremely advantageous in learning the essential aspects of marketing this business. She offered us creative, innovative and effective strategies in securing potential clients. It is very obvious that Paul & Amanda have the necessary expertise, experiences, skills and knowledge in supporting their students in being successful dental hand piece repair technicians. Again a "Great" course, well worth the monetary investment." "We chose Orion to show us how to open our business, and it was the best choice we could have made. They go above and beyond to help you succeed." "Absolutely the best value in the industry for training Dental Handpiece Repair entrepreneurs. Thanks once again for an excellent training conference." Would you like to make more money and own your own business? No pushy sales needed, just let the dentists near you know you offer handpiece repair & the business will come! Dental Handpiece Drill Repair is the most common repair service used by every dentist in the world. The dental handpiece is probably the most often-purchased piece of major equipment in dental practices, according to the results of DPR reader surveys over the past 10 years or so. On a daily basis, it's obviously the most used piece of equipment. And, because handpieces now are subjected to regular sterilization, they require repair more frequently. "Increaseing use of heat steilization of dental instruments, which tends to break down the components, has resulted in a greater need for handpiece repair globally." Private Training Courses offered year round. Profits of $100 - $400 per handpiece! You can pick up 3-8 handpieces at average offices per pick up. Do You Want to Change Your Life, add income & own your own business? Learn How to earn a very good income, grow a real business with no employees while working from home. Stable growing & recession proof industry. Every dental office is your customer. Easy to operate, no employees needed. Same equipment used worldwide, live where you want! No pushie sales needed, service is in high demand. Every dental office uses this service regularly. One Time Fee - Teaches You Everything You Need! Sale, Service & Repair high end dental equipment. We Train You! Orion is the trainer of trainers. World's largest provider of dental handpiece sales & repair training! Compare us to the rest, then come to the recognized best. We turn over all the knowledge to run the business. No ongoing fees - one time seminar or course fee. Learn from the best trainer in the business. We Want To Train You to Be Your Own Boss! Simple, low cost training shows you how to earn income quickly after training in the dental industry. 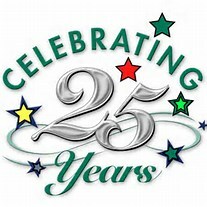 Next Year, 2020, is our 25th anniversary in business, still going strong with the original owners. Request more information via email by entering your name and email address. 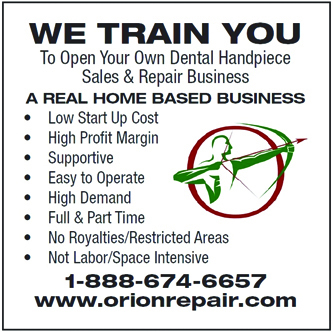 All prices are in USD • Copyright 2019 • Orion Dental Sales, Training & Repair, LLC.